In keeping with our slogan “New Horizons – New Friends”, we met so many great people at Sun ‘n Fun! Our display outside and inside hangar E was the highlight of the camping set. 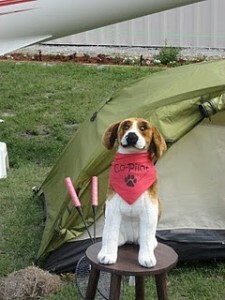 We had to keep a close eye on those who wanted to take “Couper”, our mascot, home with them. The weather was great until Sunday when everything got a good soaking. Thanks to those who attended our Air Camping Forums on Tuesday and Thursday. And a big thanks and welcome to all those who signed up to become Founding Members of AACA. You can do the same just by clicking here or by visiting “Become a founding member” on our home page. Next stop, Oshkosh… in less than a hundred days! 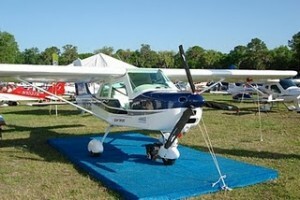 All the Light Sport aircraft on display were one of the highlights of the event. We want to know which LSA you think would be the best, and the worst, for Air Camping. One of our favorites is the Brazilian Paradise P1 which is assembled in Sebring Florida. It has lots of room for gear and even sleeps two with the seats removed. Give us your pros and cons about any light sport for air camping. We will keep score and let you know the results.